Following is the summary of the Tuesday and Wednesday two days. On Tuesday kids were very happy to see each other and teachers after long vacation. We asked them how they spent their vacation.They shared their vacation activities with us. 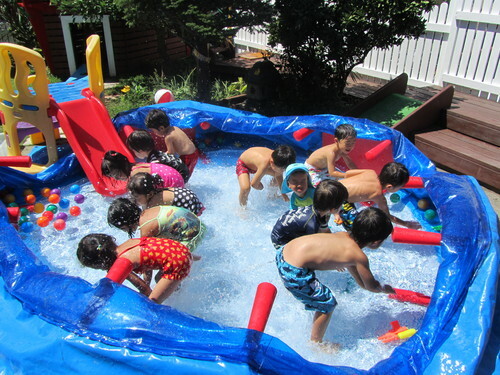 Few kids told us that they went to pool, while others went to their grandparent's house. After the vacation talks we began with our class schedule. We asked them to paint masturi lantern following which, we practiced masturi dance with the kids. Today, we began with class schedule. Then we celebrate　Friend's　birthday party. Kids enjoyed the pool. Before leaving the school they had their snacks.